Early Wednesday morning on August 2 ,2017, the Wilkes-Barre/ Scranton Penguins announced that they has signed Cody Wydo to an AHL contract for the 2017-18 season. Wydo is the player who almost single handily put the Robert Morris University hockey name on the map of teams to watch for. In 2011, the Robert Morris University hockey team was basically still unknown. The program was only in its seventh official NCAA season and hadn't boasted any fantastic achievements since it's inception in 2004. Then Cody Wydo showed up. A native of Southgate, Michigan, Wydo would go on to letter all four years he played for the Colonials and serve as Captain his senior year. At nearly a point-per-game throughout his college playing career, he would put up 150 points in 151 games played. He was an integral part of the Colonials 7-4 victory in the 2014-15 Atlantic Hockey Tournament championship where he was named to the All-Tournament Team as well as awarded tournament MVP. Those stats would lead to Wydo being named as a Hobey Baker finalist- a first in school history. As an undrafted forward, Wydo would get a shot at playing professional hockey after signing with the Wheeling Nailers in 2014, the ECHL affiliate of the Pittsburgh Penguins organization. In his two years as a Nailer, Wydo would put up impressive numbers: 116 points (54G-62A) in 138 games played. He would help lead the team to the Kelly Cup championship series in 2016 (the Nailers would lose the series four games to two to the Allen Americans). 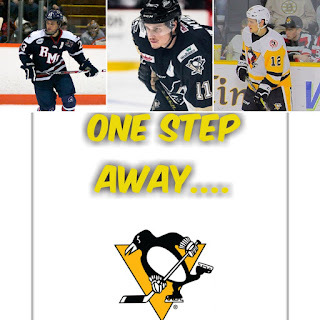 Last season, being the leader of the Nailers team with 30 goals and 60 points, Wydo would join the Wilkes-Barre Scranton Penguins on a PTO (professional try out agreement) on April 7, 2017 and play in three total games for the club. He would tally his first AHL goal the following day, April 8, versus the Providence Bruins. The WBS Penguins, a team that includes a slew of other former Wheeling Nailers, open their season Oct. 7 2017 versus the Charlotte Checkers at Mohegan Sun Arena at Casey Plaza.